Natural Calm is a supplement that contains ionic magnesium in an easily dissolvable powder. Magnesium is an important mineral, particularly for your heart, muscles and kidneys. Dietary deficiencies of magnesium are fairly common, according to the University of Maryland Medical Center website. Although magnesium occurs in the foods you eat, you may not be getting enough. Peter Gillham's Natural Calm supplement aims to provide an easy way to catch up on your magnesium intake. According to Peter Gillham's website, Natural Calm can help provide, well, calm. His website states that magnesium works in opposition to calcium in the cells of the body. Calcium enters a muscle cell in order for the muscle to contract, whereas magnesium enters in order for it to relax. A study published in the "Journal of Women's Health and Gender Based Medicine" in March of 2000 investigated the role of magnesium in anxiety associated with PMS. Researchers discovered that magnesium and vitamin B6 were effective in reducing anxiety in women with PMS. 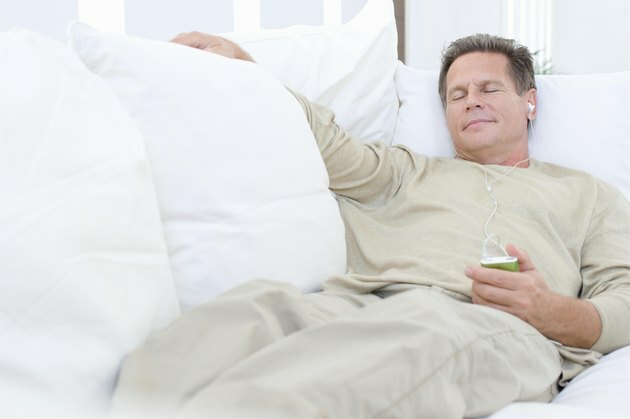 Taking Natural Calm may help improve your sleep patterns. According to a study in the September 2001 issue of "Behavior Genetics," normal sleep patterns are associated with having adequate magnesium levels. In the study, levels of magnesium in the bodies and brains of rats were measured; researchers concluded that rats who had less paradoxical, or abnormal, sleep had higher levels of magnesium. Rats with lower magnesium experienced more paradoxical sleep patterns. If you have sleep concerns, talk to your doctor. Magnesium may help, but a deficiency may not be the cause of your insomnia. Some studies show that magnesium may help ease symptoms of depression. The journal "Medical Hypotheses" featured a study in March 2006 that investigated the potential benefits of magnesium. According to the article, if magnesium levels are deficient, the neurons in your brain are not able to function properly, causing damage that can lead to depression. The researchers also state that magnesium supplementation fueled rapid recovery from depression when it was given with a meal before bed. If you suffer from depression, talk to your doctor. Natural Calm is not meant as a cure or treatment for depression. Natural Calm's creator states that the product may be good for headaches and tense muscles. The University of Maryland Medical Center states that magnesium can prevent migraine headaches, particularly for people with magnesium deficiency. The website also states that it can be helpful for people suffering from fibromyalgia, a disorder characterized by painful and tender muscles. If you suffer from chronic pain, talk to your doctor before trying Natural Calm. One of magnesium's major roles is to maintain normal heart muscle function. Thus, if you are deficient in magnesium, taking Natural Calm may help to keep your heart in rhythm. According to the University of Maryland Medical Center, magnesium is needed to maintain a normal heart rhythm. The site also states that it is sometimes given intravenously while you are in the hospital to lower the chance of developing atrial fibrillation and cardiac arrhythmia, or irregular heartbeat. Talk to your doctor before taking magnesium for heart-related disorders.